To prevent your pet from causing damage or injuring itself, it is important to remove objects from the floor or from low places. Also remember to secure wires or cords out of a teething puppy’s reach as well. Or, protect them with plastic sheaths. By supplying your teething puppy with plenty of toys, it will not need to chew elsewhere. You can even use a little bit of peanut butter on a toy to encourage chewing, but do not overdo it. To keep your puppy’s interest, you can additionally try different flavors, but make sure that whatever you use is safe. If you have a clean dishcloth handy, you can make your own toy to help your puppy find relief for irritated gums. All you need to do is dampen the cloth with water, wring it out, then freeze it while twisted. The cold rope will not only give your puppy something to chew but help bring relief to irritated gums as well. 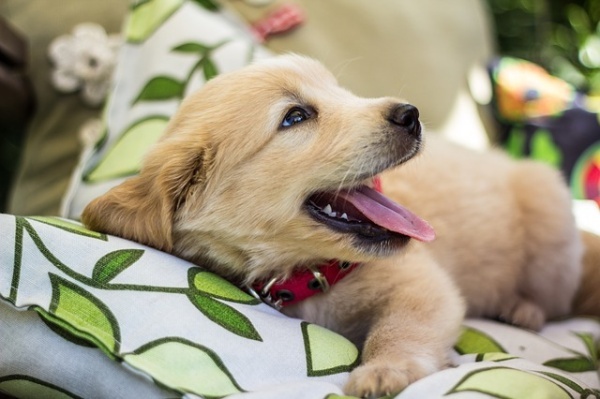 Not only do ice cubes help keep your puppy cool, but chewing on one can help reduce the swelling and bring some relief for a short period of time. You can place ice cubes in the water dish for the puppy to work on. If you have a toy breed, you can provide crushed ice instead of ice cubes. Although it may not be for everyone, there are some that will recommend massaging your puppy’s gums to help relieve irritation. This can be done by gently holding your pet’s jaw and rubbing both upper and lower gums for a few minutes a day. Exercising your puppy on a regular basis will not only keep its energy down but provide a distraction from the teething process. By taking your puppy for walks or letting it loose in the yard under your supervision, you give it something else to focus on. To help prevent chewing, it is crucial to always keep an eye on your pet. When you cannot, it is best to confine it to a bedroom, pen, or crate. Just be sure to have plenty of chew toys available to help relieve stress. It is important to remember that a teething puppy will eventually grow out of the stage. As long as you remain patient and refer to these six tips for managing a teething puppy, you can make it a less stressful ordeal.